Having a good relationship with your in-laws especially your father-in-law is essential to keep a good harmony in the family. Though you may not see each other every day, a simple communication through call and telling him how much you care is enough. On his big day, make him feel special and return all the love he made you feel by cooking his favorite food, taking him to his happy place, joining him on his favorite sport, and sending him the sweetest birthday message. Here are some ideas to wishing your father-in-law the best birthday ever. To the most decisive man I know, happy birthday my strong father-in-law. I am grateful for accepting me into your family. You are not only an in-law to me but a real father. Have a wonderful birthday today! You have your own set of doubts when I asked for your daughter’s hand, but I am so much thankful that you agreed anyway. On your birthday, I promise that I will take care and love her forever for you have raised an amazing woman. Happy birthday, best father-in-law. When I was first introduced to you by your lovely daughter, I remember the harsh look you gave me. Now, you are one of my best buddies. Our relationship with each other was a bumpy ride but I’m glad that you opened up to me. You are truly a friend rather than an in-law now. Happy birthday to the best father-in-law in this world. Dearest father-in-law, always remember that age is just a number. On your special day, I wish for that more youthful glow. I am happy to be a part of your life. Happy birthday to you! I heard that most people are having a hard time dealing with their in-laws. I am so lucky to have an understanding father-in-law like you in my life. You treat me as your own and that is the greatest blessing of all. Happy birthday! To the greatest dad-in-law, here’s to another year of a life filled with love and delight! May you have the most wonderful birthday today. My father treated me as a princess when I was growing up. My heart is full of happiness now because when I got married to your son, not only that he treated me as a queen, but you crowned me as your princess too! Happy birthday, father-in-law! 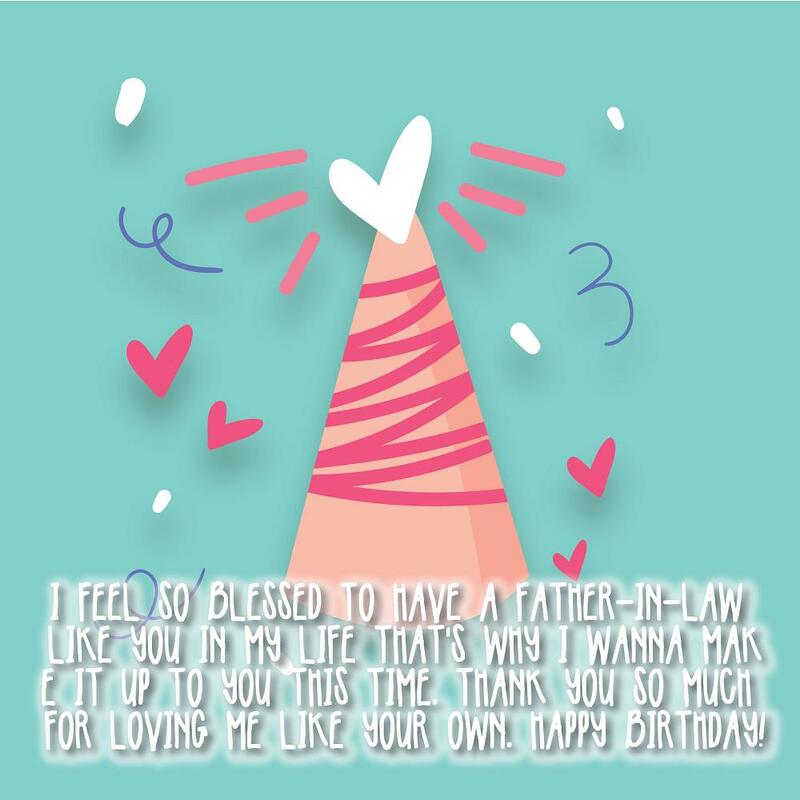 Dear father-in-law, it may be your birthday today but I feel like I’m the one who received the greatest gift of all – that is having you in my life. So each of those candle on your birthday cake symbolizes the number of years I have been lucky. Happy birthday, dad! To the best daddy-in-law in the entire universe, today, I will follow all of your requests and do as you command for it is your very special day. Happiest birthday to you! I cannot thank you enough for being the best father-in-law I can ever imagine. It seems like you already have everything, but my prayer to God is still to bless you with good health and guide you each day of your life. Happy birthday! People could not believe that you are my in-law, they always think that you are my own dad. Our relationship is so pleasant that being with you is as comfortable as being with my own family. Have an amazing birthday daddy-in-law! How I wish I have met your son earlier and got married to him way sooner. Not only because he is amazing but also because he has one of the coolest father I know. Thank you for being a fun dad-in-law to me. Let’s cheers to your best birthday! Every single day of your life you are taking care of your children and family. Now on your big day, let us pamper you and allow us give back all the love that you have given us. So sit back, relax, and just enjoy your day. Happy birthday, father-in-law! I thought I was the luckiest man alive for having an awesome father. Little did I know that I will be even luckier to have an amazing father-in-law like you! I have never felt out of place in your family and I am so much thankful for that. I hope your birthday will be as wonderful as you are! On your big day daddy-in-law, I would like to propose something along with a toast. That is, we call each other dad and son. How does that sound? Happy birthday to the best in-law! You are successful in every field and I do not really know what to get you for a gift. So on your very special day, I am wishing you more wealth, more health, and beautiful grandchildren! To the most spectacular father-in-law, happy birthday to you! Dear father-in-law, you always put your family first in everything that you do and every decision that you make. Today, we all insist that you forget about us for a day and focus on yourself. You deserve all the great things in life. Best birthday to you! A fantastic birthday to the most astonishing father-in-law anyone can ever have! I hope that this day brings you everything that you have been praying and working for in the past years of your life. We are so proud of you and we love you forever! Being married to your daughter makes me forget the contrast between my own father and you! It is because you have treated me as your own and nothing else feels as amazing as it is. Happy birthday, daddy-in-law! You are not just a great father-in-law to me but you are also one of the most remarkable person I have ever met. Your compassion, kindness, affection, and sincerity are just simply breathtaking. I’m thankful that my wife/husband was raised by an amazing man like you. Happy birthday, dad! Just when I thought that younger generations are cool, you have proved me wrong. You are one of the coolest person I know and I’m glad that we are now family. I am beyond proud to have you in my life. Happy birthday, dad-in-law! You are truly my second father. There was never a day that I did not feel your love and support. I always thank God for giving me the greatest gift of knowing you. Blessed birthday to my daddy number 2! I know that I am already a grown-up, but when I reach the same age as yours, my dream is to become like you. You are my motivation and inspiration in life. You have raised a beautiful daughter and I promise to raise your grandchildren the same way too. Best birthday, dad-in-law! 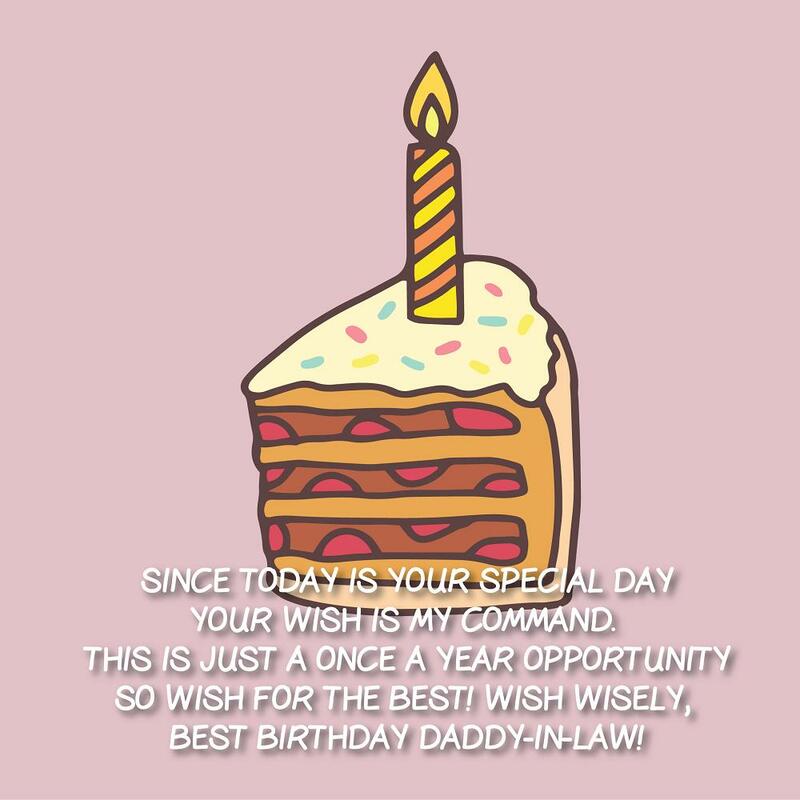 To the best daddy-in-law in the entire galaxy, happiest birthday to you. Every year on your birthday, the sky lights up because you are an exceptional one! We love you to the moon and back! Dear father-in-law, you are one of the people who gave my life a real meaning – to love unconditionally. You have showed me how to be a great parent by giving your pure affection and support. Today on your birthday, I wish you all the happiness in life. Best birthday to you! With all the things that we have been through, I guess calling you dad-in-law would be lame. Starting today on your birthday, I will be calling you dad. Have a wonderful birthday, daddy! One of the reasons I am sure that you are extraordinary is because my kids always wanted to be around you. Not only are you a spectacular grandfather but a remarkable father-in-law to me as well. May you have an unforgettable birthday today! To my sweet father-in-law, I hope your birthday will be as amazing as you are. Love lots, your sweetest son-in-law/ daughter-in-law. Since I got married, I never forget to thank God every day for having such an amazing wife/husband. Today on your big day, I will be thanking you big time for raising a wonderful woman/man. Thank you daddy! You are the best father-in-law ever! Happy birthday to you! Your birthday reminds me of how blessed I am to have you every year of my life from the day that I got married to your son/daughter. Your family is a treasure that I’ll cherish forever. Happy birthday, father-in-law! I am overwhelmed and relieved to learn that the person I got married to grew up exactly like his/her wonderful father. You did great! Thank you and happy birthday, dad-in-law! 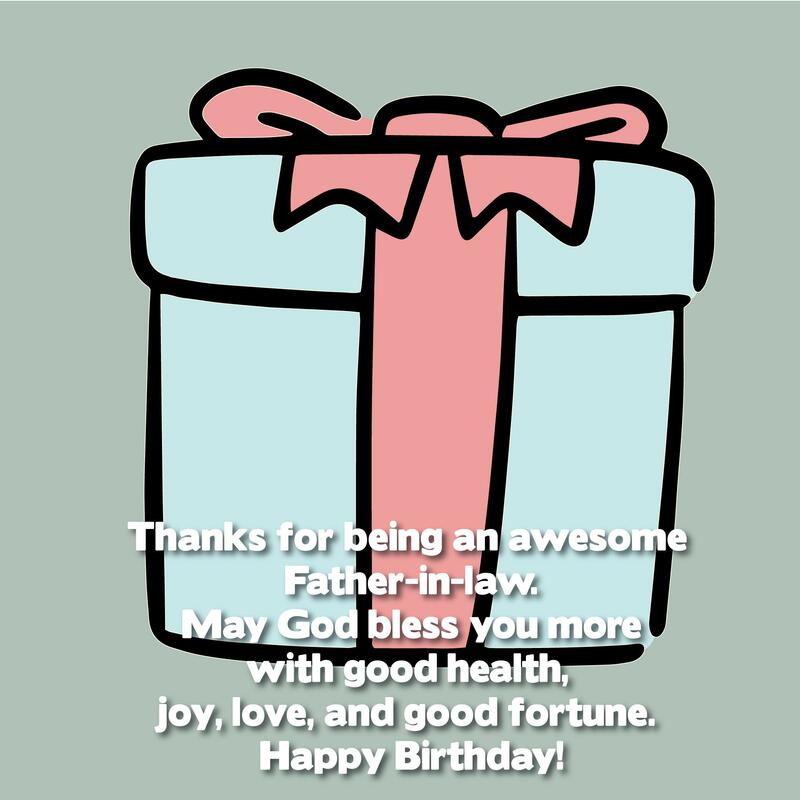 Have a marvelous birthday, father-in-law! I pray that the Lord grants every desire of your heart because you deserve it. May you also have a less stressful and longer life. You are truly the pillar of this family and thank you for holding us all together. We love you! On your special day, we will make you feel even more special! We will throw the biggest and the best party you’ll ever have. We will celebrate like there’s no tomorrow. And we will drink all of your favorite wine! So cheers to adding one more year to your life! Happy birthday to my cool father-in-law! I am so fortunate to have 3 men in my life who gives me unending love, support, and guidance – my own dad, you, and my husband. Thank you for being an amazing father-in-law to me. May you have an incredible birthday! It is phenomenal how one person can make a big impact to your life and play different roles. You are an amazing father-in-law, friend, and adviser to me. May the divine bless you with happiness, love, strength, and good health. Happiest birthday, daddy-in-law! It is like I hit the jackpot when I got married to your daughter/son. 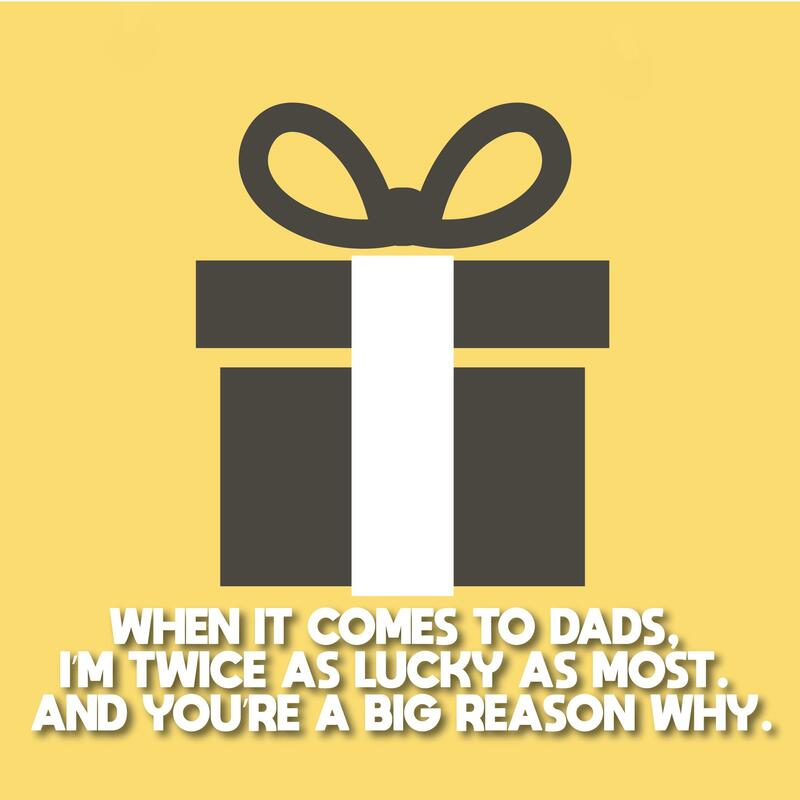 Not only because of her/him, but also because I got the best father-in-law in the world! Best birthday, daddy! 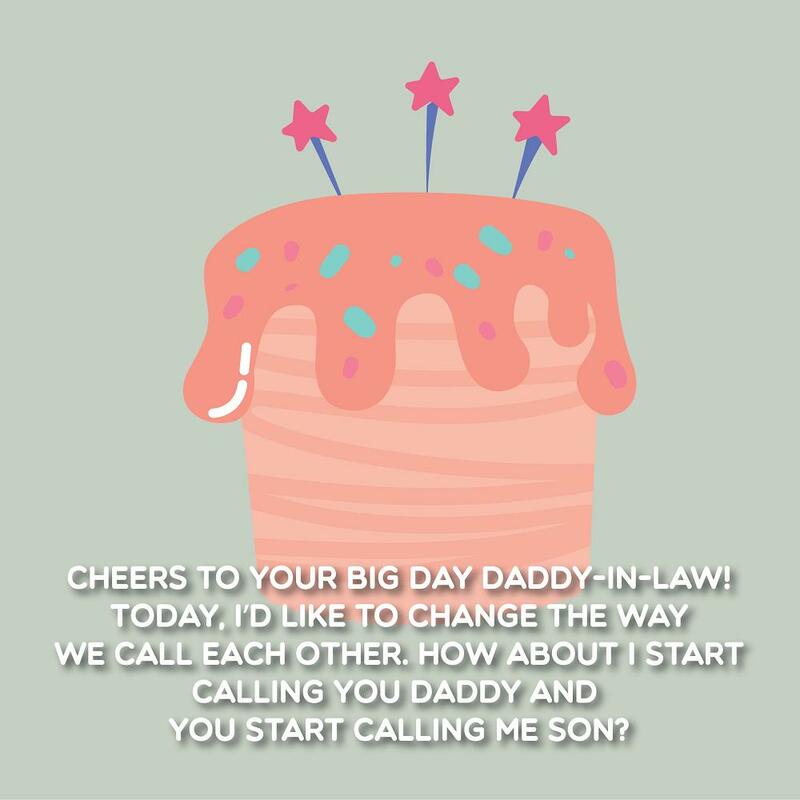 Have a magnificent birthday, daddy-in-law! Someone who is as awe-inspiring as you deserve the Best Father-in-Law in the world award. You are our champion! We love you! Dearest father-in-law, though I can’t be there on your birthday, I am sending all my love, hugs, and wishes to you! Have a smashing birthday today! Know that we always love you! There are no words to describe how great of a father-in-law you are to me. You are even one of the best people I have met in my whole existence. I am glad that our paths have crossed through your son/daughter. Happy birthday, dad! Whenever I think of how much you made me feel like your own son rather than an in-law, my heart always skips a beat! You are the best and I couldn’t ask for another one to be my dad-in-law. Happy birthday to you! I was a bit terrified if I will fit right in into a new family when I got married. Thank God you happened to be the best father-in-law in the world. I immediately feel connected and secure. Have a magnificent birthday, dad-in-law! I have never imagined my married life to be this good. Great husband/wife, amazing kids, and a super incredible father-in-law! God may have blessed me with all the good stuff. Happy birthday, daddy-in-law! You always bring me peace of mind whenever I remember that you will always be there beside me to support and guide me. A father-in-law like you is very hard to find and I’m thankful that you love me as your own. May you continue to be a blessing and happy birthday! Today is the best day to transform our ties with each other. You will not only be an in-law to me but a real father for you have treated me the same. May you have a magnificent birthday, daddy! I honestly thought that being involved in a whole new family would be tough, but you have proved me wrong. The journey to being a part of your family is so effortless and calming. Everyone has showed me love and sincerity especially you, my father-in-law. Thank you and I hope for a prosperous birthday and a life filled with joy and delight! Dearest daddy-in-law, your existence gave me two of the most beautiful gifts I have ever received – the love I felt from you and your son, my husband. I know that a simple thank you will not suffice nor any material presents, so I’ll start with wishing you a very happy birthday! To my precious father-in-law, happiest birthday to you! As you walk down the memory lane of all the happy moments you have experienced in your life, I hope you won’t forget about how much I care and love you like my own dad. I wish you nothing but happiness, overflowing love, and good health. To the number one father-in-law in the entire universe, happy birthday to you! May your big day be full of happiness, blessings, and love! Sending all our sweetest kisses to you. We love you a lot! Your son is the most wonderful man I have ever met in my life and I owe it all to you! You have raised the smartest gentleman in the world and now I know why, because you are one too! Happy birthday, dad-in-law! Dear father-in-law, I salute you for keeping the family safe and secure all the time. You are truly an inspiration to all of us. Happy birthday to you! I do not understand why people are saying that in-laws are terrible. I have the best one in the world especially my sweet father-in-law! He is the most compassionate person I have ever seen even to those he doesn’t know. Happy birthday, daddy! Our misunderstandings are nothing compared to how much we love each other. We may fight and argue but at the end of the day, we hug and drink to whatever happened. Today, on your birthday, we will drink until we pass out! Happy birthday, father-in-law! It is rare to find a father-in-law like you, that’s why I promised myself to take care and value you forever. May you have a long life filled with peace and happiness. Happy birthday! You are so strong not just physically but mostly mentally and emotionally. Not only that you keep yourself together but the whole family as well. On your birthday, I want you to know how special you are to us. Happy birthday, father-in-law! Dear dad-in-law, a wonderful birthday to you! A man like you who has a strong passion to love everyone around you is a treasure! I’m glad to be a part of your life. Let me spoil you today by saying you are incredible! Apart from having a new life after marriage, I was scared of dealing with an evil father-in-law as they say. I’m just relieved that you happened to be an angel. Plus, you have raised a gorgeous woman. Thank you dad-in-law! Happy birthday! If I have only one wish to ask for, I would ask for your happiness. It is because you have dedicated your life making us happy and now it’s your turn. Best birthday, dad-in-law! Just like my devotion to your daughter to love her and keep her safe, I would also give you my word that I will treat you and the whole family equally the same. Happy birthday to my great father-in-law! You have exceeded all my expectations as an amazing father-in-law. I guess, there are just no words to describe how extraordinary you are. Happy birthday! It is not every day that you can hear about an awesome in-law relationship. Mostly, it is like a cat and mouse thing. But for us, everything is so pleasant and peaceful that sometimes I’m not sure if this is just a dream. Thank you for being good to me. Happy birthday, daddy-in-law! As you age today, know that you’ve been sharing us years and years of knowledge, kindness, and love and we couldn’t thank you enough for that. Happiest birthday to the smartest man I know, my father-in-law. We love you! Now that I have experienced being a part of your life, I am not sure if I can still go back to not knowing you. Everything else became wonderful when I get to be a part of the family. Thank you father-in-law and happy birthday to you! You never fail to remind us every day of how much you love the whole family. On your birthday, let us give back all of our love to you! Stay amazing daddy-in-law. Happy birthday! You are simply incredible but what amazes me the most is the way you treat your daughters-in-law. I have never felt lesser than that of your own daughter. Happy birthday, sweet dad-in-law! To the strongest man I know who will do and sacrifice everything just to provide for his family, my father-in-law, happiest birthday to you! We know how much you love cake, food, and wine. So today on your special day, we have brought a lot of them for you to enjoy. May this be one of the greatest days of your life. Happy birthday, father-in-law! You are the most selfless person I know. You have devoted your life to us even if sometimes your own happiness is at stake. To my father-in-law who deserve to all good things, happy birthday! Dear father-in-law, I want to let you know that you are so special to us and we are always here for you whenever you needed help and support. Happy birthday! To my very supportive father-in-law, thank you for accepting me into your family with open arms. I will always be thankful of it! Happy birthday! To my personal mentor, guru, and adviser, my intelligent father-in-law, happy birthday to you. I hope you don’t mind me asking for advice all the time, it’s just that you are the most logical person I know. You are my inspiration! There are a lot of things I adore about you, but what amazes me the most is your philosophies in life that always result to having the best decisions. Happy birthday to my genius father-in-law! It is incredible how you see birthdays as a proof that you are getting smarter and stronger rather than being older. Please continue to be positive all the time. Happy birthday, father-in-law! Dear father-in-law, I want to let you know how much I appreciate all the effort and love that you have shared with us. Without you, our lives may be on a different path. You are so wonderful just the way you are. Happiest birthday to you! You deserve to have more than a hundred wishes on your birthday. I hope that you’ll spend one of those to wishing more years with us together. Happy birthday, dad-in-law! My husband is so amazing because he grew up with the best father and role model. On your birthday, I would like to thank you whole-heartedly for raising a wonderful man. Happy birthday, father-in-law! My greatest blessing in life, my wife, came from you and I am truly grateful for how amazing of a woman she is. You have done a great job and I hope I can live up to your standards with your grand kids. Happy birthday, dad-in-law! To the most loving father-in-law in the world, happy birthday! I pray for your long and happy life so we can spend more time together as a family. We love you, Dad! Whenever there are occasions in the family, I always get excited especially during your birthday because we get some time to spend together. You are one of the coolest people I know and to have you as my father-in-law is beyond amazing. Happy birthday, cool dad! To the person who told us to be strong and brave in every situation, to my beloved father-in-law, happiest birthday to you! We love you more than words can ever express! Thank you for being the most understanding person in the family. You always mediate between arguments and you literally hold the pieces together. You are simply wonderful! Father-in-law, we appreciate you and may you have the best birthday! For someone who has achieved so much in life not just with career but also with family, you should really be proud for you are on top! But it amazes me how humble and kind you still are. Happy birthday, daddy-in-law! If my words and actions are not enough to describe how massive my love for you is, I hope that this cake along with your birthday candles will be sufficient. Happy birthday father-in-law! 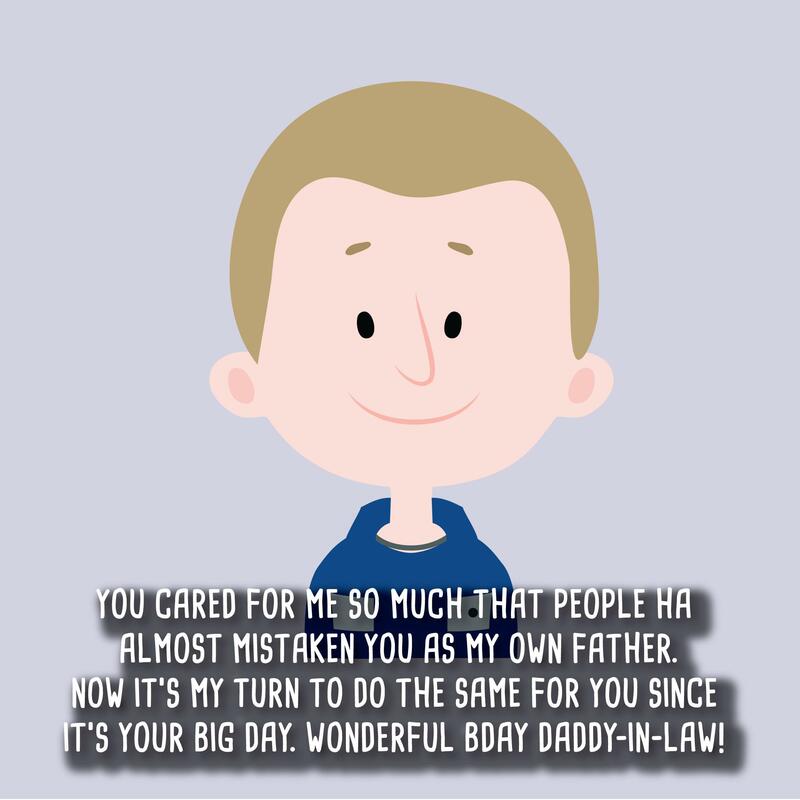 You have been my father-in-law only for the past year but it feels like I have known you forever! You gave me comfort when I was anxious about being a part of the family and I hope we’ll spend more years together. Happy birthday, pops! Of all my in-laws, you are my favorite! Please don’t tell the others, let’s keep it a secret! Happiest birthday to the funniest dad-in-law in the world! You have showed me how a balanced life should look like. You treat my mother-in-law as a queen, and my wife as a princess. I vow to do the same to your daughter. Happy birthday dearest father-in-law! Your birthday cake symbolizes how sweet my love for you is! So indulge and enjoy each bite! To my amazing dad-in-law, happy birthday! We’ve only been together for a year as in-laws, but I can already tell that we will get along with each other forever! You are like my own father to me and I’m excited to spend more times together. Have an awesome birthday, dad-in-law! I guess you are my number 2 fan next to my husband. You support me without any doubts and treat me as your own daughter. Happy birthday to you father-in-law! I have never seen anyone who is as balanced as you are. You are truly the living definition of inner peace. To my dearest father-in-law, happiest birthday to you! Your awesomeness brings light and joy to our family. You are definitely the life of every party. To my cool daddy-in-law, happy birthday to you! You have the wisdom of an old soul and your bravery amazes every person around you. We are all thankful that you are a part of our lives. Best birthday to you, father-in-law. People say that love means kindness and compassion, if that is true, then your name should be changed to love. To the most benevolent father-in-law in the world, happy birthday! We will not be where we are right now if not for you father-in-law. You have given us your never ending support and love. On your birthday, we wish you a remarkable one. Happy birthday, papa! You may be a bit old but it really doesn’t matter. If there is something that adds up other than your age, it is your wisdom and strength. To the most intelligent and strongest man I know, happy birthday father-in-law! On your birthday today, we will not only celebrate your age. We will celebrate how wonderful of a person you are! Happy birthday, father-in-law! My only prayer to God is to bless this day with overwhelming happiness and love, one that is so remarkable you’ll remember it until the end. Happy birthday, dad-in-law! It is easy to be an amazing father, but to be an incredible father-in-law is something that not everyone can pull off. I am lucky to have you as my daddy-in-law. Happy birthday! Dear father-in-law, always remember how much I treasure you. I hope that you continue to be strong, smart, humble, and kind. Have a spectacular birthday today! We love you! I wish that your birthday will be showered with all the great things in life and may it be filled with love from the people close to your heart. Happy birthday, father-in-law! I never felt like I am not your blood because you always treat me as your own daughter. On your birthday, I want to let you know how grateful I am because of that. Happy birthday, dad-in-law! 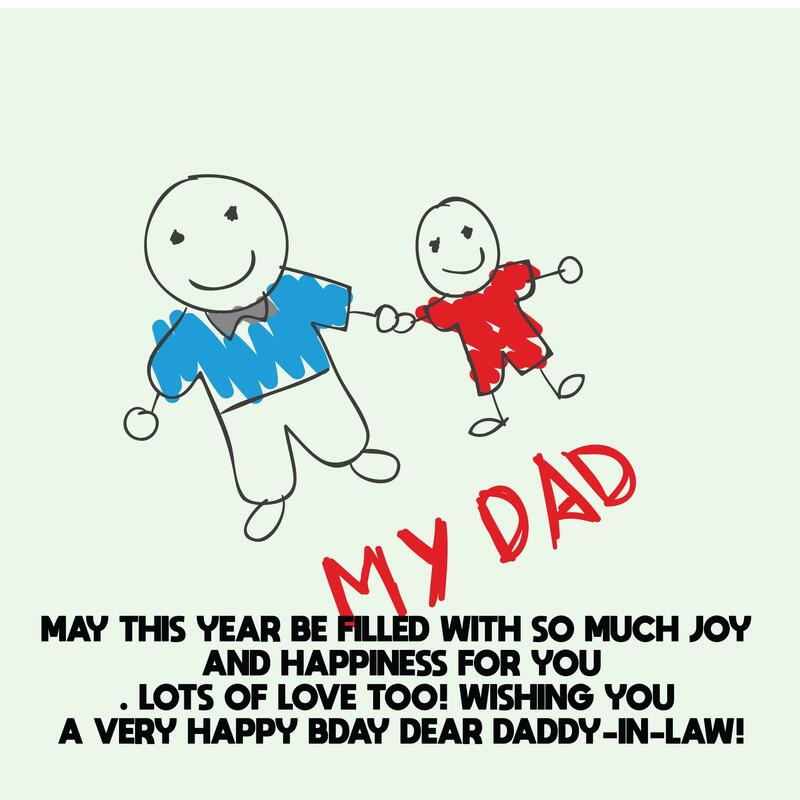 A hearty birthday greeting to my loving father-in-law. You motivate us to reach the highest goals and we’re thankful for that. Enjoy your big day! Ever since day one, my respect for you has always been the highest. You are one of the most remarkable people I have ever known and I thank God for that. Happy birthday, father-in-law! To one of the very few exceptional men I know, my father-in-law, a hearty birthday to you! I really wish I could be there with you to celebrate your big day, but I’m sending my love and wishes instead. We love you so much! Mom-in-law is truly happy and satisfied with you. No wonder why, you are one excellent husband and father. I am glad that my husband/wife got your attitude. Have an amazing birthday! I could never ask for anyone else in this world other than your son. He is packed with good values and morals, loves and cares for me, and is a good example to our children. Thank you for teaching him everything. I always see you in him. Happy birthday, father-in-law! To the greatest father-in-law in the world, a magical birthday to you! Every year on this date, the sky becomes so bright, it celebrates with one of the brightest person I know – you! Have a blast! A very special person like you deserves an equally special birthday party! So today, father-in-law, we will have a blast! Cheers to another year of creating memories together. Happy birthday! Sometimes I ask myself if I have done something good in my past life to deserve you in my life. You are seriously one of the best people I know and you have inspired me to be the best that I can be. Happy birthday, father-in-law! Although we do not see each other every day, always remember that you are always in our minds and hearts. May you have a long life that is full of love and success. Dearest father-in-law, happy birthday to you! With all the love in my heart, I would like to greet you a very happy birthday! You have changed our lives tremendously and we thank you for that. Love you, father-in-law! I am grateful for your willingness to keep a healthy relationship not just between us but also to all of your in-laws. I respect and adore you for that. To my great father-in-law, happiest birthday to you! Having you in my life is one of the biggest blessings I have ever received from the Lord above. A father-in-law that is so strong, intelligent and loving is definitely a gift from God. It brings me comfort knowing that we are now a family. Happy birthday, dad-in-law! To the most important and respected person in this family, my father-in-law, happy birthday to you! You are the best thing that happened to me next to getting married to your son/daughter. The size of your cake defines the amount of love I have for you. I definitely need to get you a much bigger one! Happy birthday sweetest father-in-law! You have provided me with the best blessing of my life – my other half! Now that it is your birthday, we are surprising you with one of the greatest blessings, a new addition to the family – you’ll be a granddad! Happy birthday, father-in-law! We only meet during family gatherings and it’s not really that much to be honest. I just want you to know that though we may not meet for years or decades, you will remain in my heart forever. Happiest birthday to you, father-in-law! If all in-laws are like you, there wouldn’t be a word for in-laws in the first place. It would just be dad, papa, or daddy! It’s because you made me feel like your own. Happy birthday, dad-in-law! They say that fathers-in-law are of different kinds. There’s one that’s like the scary fathers-in-law and the other one, those who act like real fathers. You are part of the latter. Happy birthday, just father! My kids just love to spend all of their time with you. They never get bored with your stories and I honestly do not mind it at all. It is because you are a motivation to them to behave well. Thank you and happy birthday, dad-in-law! People are always surprised to know that you are my father-in-law, they always thought that you are my real father especially when they heard me calling you pops. Happy birthday, pops-in-law! The wrinkles on your face is a proof of all the hardships and problems you have overcome. So do not mind adding one more year to your age. Have a phenomenal birthday, father-in-law! When I got married to your child, I already have received a great present from God. When I got close to you, my father-in-law, the feeling is even so heavenly! Your guidance is all I need. Happy birthday, dad-in-law! Dear father-in-law, you have the most authentic soul I have genuinely felt! You are talented, smart, and kind. I am glad that my kids will grow up with a grandpa like you. Happy birthday! To my father-in-law, whenever I’m around you, I always feel proud of my crafts. That is because of your constant appreciation for it. I’m glad to have a very supporting dad-in-law like you. Happy birthday! Dear dad-in-law, you are truly a man of honor. Every word that comes out of your mouth is full of wisdom and truth. I am lucky to be your daughter/son-in-law. Happy birthday to you! Father-in-law, you may not like me with all your heart, but know that I always love and respect you and I will do anything to win your heart. Happy birthday! Just in case you are not aware, you have given me the best source of happiness in the world – your daughter/son. Please know that I will always be thankful for everything even if I do not say it. Happiest birthday to you, father-in-law!